White Spots on Nails may indicate: Trauma, Stress or Zinc deficiency! 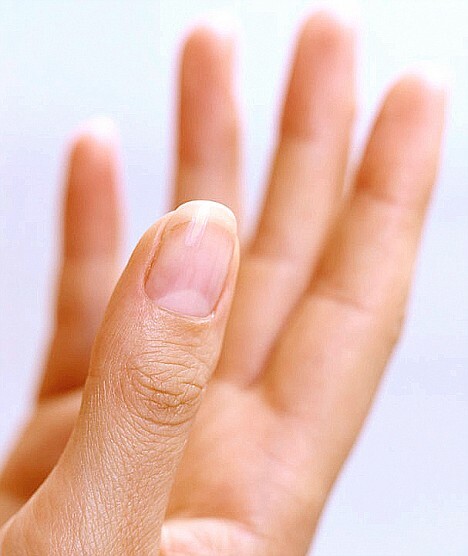 White spots on the fingernails belong to the most common ‘nail abnormalities’. Many people associate these whith spots with a calcium deficiency. However, the truth is that usually they do not relate to any’ health’ problem at all! A white spot is usually caused by a minor finger-related trauma! In medical sciences a white spot on a fingernail is known as ‘leukonychia punctata’ – this name relates to the availability of nucleated keratinocytes. NOTICE: A narrow white line in the nail – a.k.a. 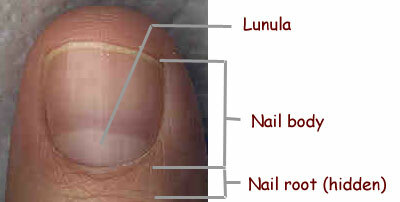 ‘transverse leukonychia’ – is another type of nail disorder. White spots are typically caused by random minor trauma – including: pushing nail cuticles, or ‘nervous’ cuticle picking! This explains why white spots in nails are often seen in the hands of children! 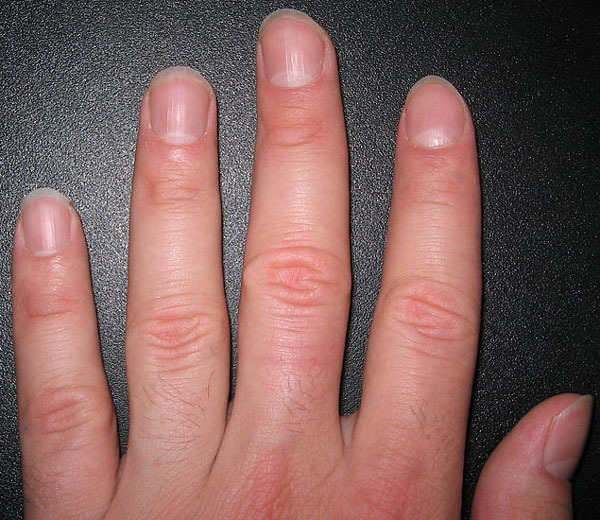 WHITE SPOTS IN FINGERNAILS – Cause: usually minor trauma, sometimes zinc deficiency! 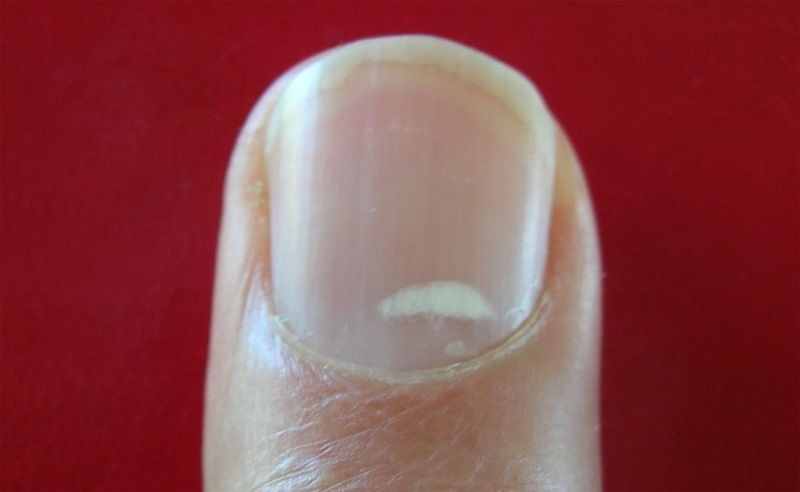 White spots are probably the most common ‘abnormality’ that can be observed in fingernails. Many people associate them with calcium deficiency, but the truth is that usually they do not relate to any health problem at all! In medical science white spots in fingernails are also known as ‘leukonychia punctata’ – which related to the presence of nucleated keratinocytes (contrary: narrow white lines in the nails are known as ‘transverse leukonychia’). Usually white spots are caused by random minor trauma – which also explains why they are relatively common in the hands of children! Sometimes white spots can indicate a zinc deficiency! White spots can sometimes be associated with a zinc deficiency – this was e.g. pointed out in a 1974 study, titled: ‘Fingernail white spots: possible zinc deficiency‘. White spots do NOT indicate a calcium deficiency! 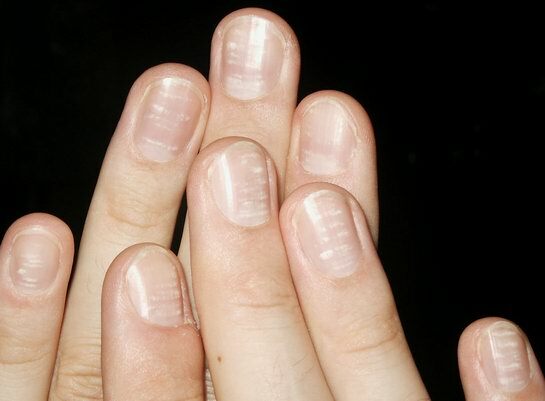 NOTICE: Thin, brittle nails can be caused by calcium deficiency! White spots do NOT indicate an iron deficiency! NOTICE: Spoon-shaped nails (see photo below) may be a clue to a thyroid deficiency or iron deficiency anemia! So, despite the many assocations – most of the stories about ‘white spots’ in fingernails are myths that are proably based on false anecdotal evidence! 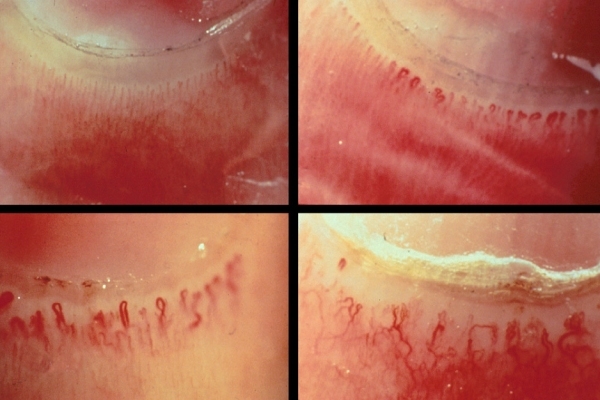 • The clubbing nail: developments, treatment & prevention! • Megan Fox has a ‘clubbed thumb’ – not to be confused with ‘fingernail clubbing’! FINGERNAILS – 3 Signs of Health Problems: Beau’s lines, yellow fingernail syndrome & nail pitting! Learn about some nail conditions that might require medical attention. If you have a nail problem that doesn’t seem to be going away, or is associated with other signs and symptoms, make an appointment with your doctor to get it checked out. Yellow nail syndrome concerns the yellow discoloration in your fingernails may result from a respiratory condition, such as chronic bronchitis, or from swelling of your hands (lymphedema). 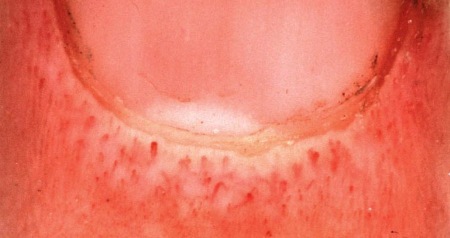 In yellow nail syndrome, nails thicken and new growth slows, resulting in discoloration. 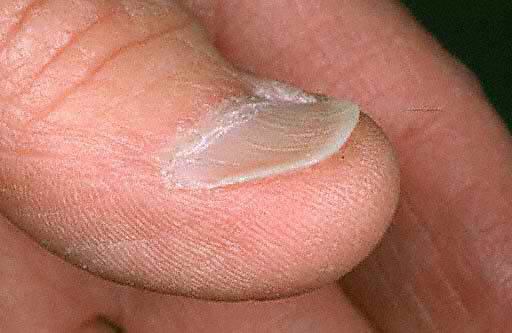 Nails affected with this condition may lack a cuticle and may detach from the nail bed in places. Although this condition is often a sign of respiratory disease, it’s possible to have yellow nails and not have a respiratory condition. Yellow nails may also result from any condition that causes the growth of your nails to slow down. Small depressions in the nails are common in people with psoriasis — a skin condition that produces scaly patches. They may also result from nail injuries. Pitting may cause your nails to crumble. Pitting is also associated with conditions that can damage your nail’s cuticle, such as chronic dermatitis of your fingers or alopecia areata, an autoimmune disease that causes hair loss! • Nail disorders in the hands of children! • Nail disorders in the hands of the elderly! • More news & facts about fingernails! 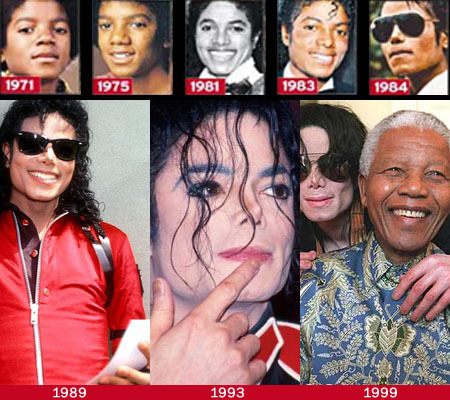 Michael Jackson: ‘fingernails of time’! Michael Jackson’s fingernails in time! 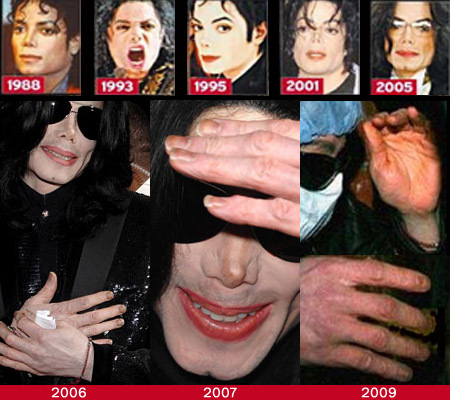 Were Michael Jackson’s dark fingernails + nail moons caused by his health condition? Was his nail condition the result of medication/drug abuse?? Or, did the color of his fingernails look ‘weird’ merely because the color of his skin had become lighter over the years??? Obviously, during the past few months many people got wondering about those questions. Therefore a new PHOTO ESSAY on Michael Jackson’s finger nails is presented in order to find permanent answers. “Between 1989 and 1999 his skin had become lighter, and the condition of his fingernails became a bit more ‘pink’. But at the Michael Jackson meeting with Nelson Mandela the color of his fingernails appeared as quite ‘balanced’ and ‘normal’ (possibly only a bit ‘faint’ in the center of the nail plate). • In memoriam: the hands of Michael Jackson! • Famous hands: the hand of celebrities! 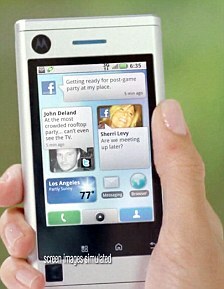 • ‘Hand facts’ – News reports about hands!